For anyone who spends any time on home decorating blogs, Pinterest or hey, the real world, you know that farmhouse kitchens are hot. Did they ever stop being “hot”? 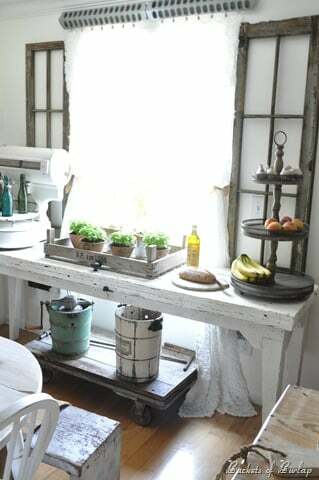 I think every decade has had their own version of the farmhouse kitchen. Warm, friendly, nostalgic spaces, they are perfect spots for long conversations, good red wine, and Saturday morning waffle sessions. (Do you guys notice I mention good red wine, a lot? ;)) Today we freshen up the farmhouse kitchen with some modern touches, minimal decor and simple color schemes but one thing remains the same… we drool over those gorgeous spaces. Really, truly, drool. Fortunately for you, loyal readers, we know a bunch of highly talented bloggers who have just such kitchens, and have opened up their homes to share with the rest of us. 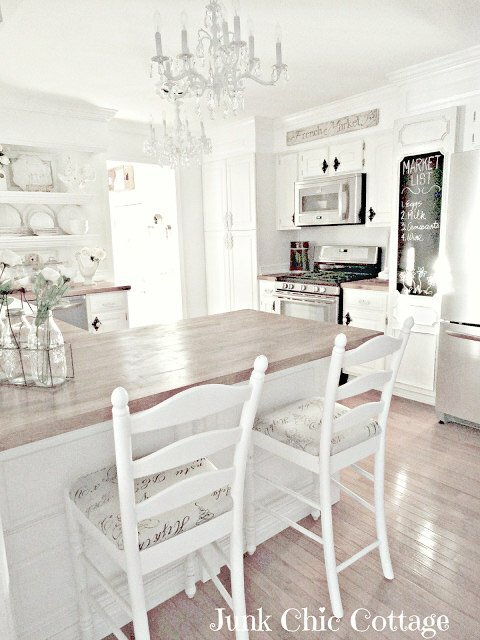 So on this “episode” of drool worthy decor, we bring you farmhouse kitchens! If you haven’t visited KariAnne at ‘Thistlewood Farms’, then you really have to… Her entire home/property is drool worthy! Seriously, jealous beyond belief. But today, she has agreed to share with us her farmhouse style kitchen, above and below. 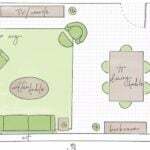 Please don’t forget to spend some time at her site, we can all learn some home decorating and garden ideas from her, even if we aren’t “living the dream”! (Yet!) Just visit her projects page, and you will have enough to keep you busy recreating her signature style for quite some time! 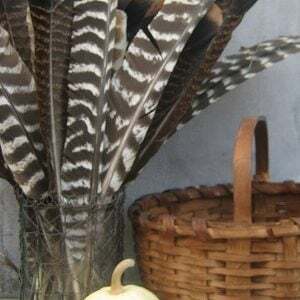 If you love distressed, gorgeous antique looking furniture, and the DIY projects that go along with it, chances are you have heard of ‘Miss Mustard Seed‘. 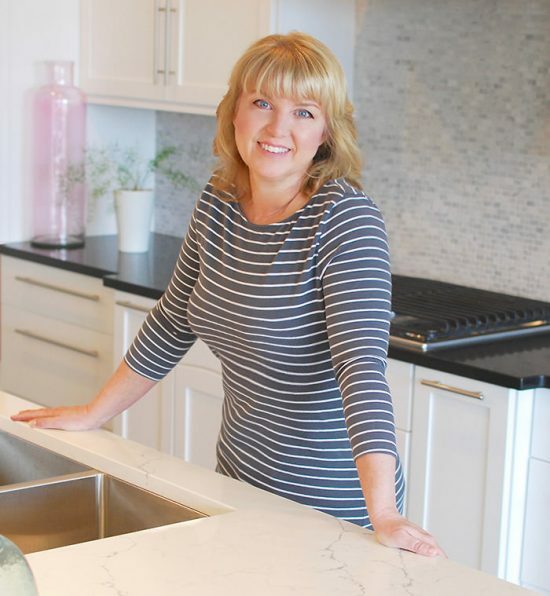 Marian doesn’t just paint furniture however, she has a beautiful home, complete with a farmhouse style kitchen we just had to share with you. And learn all about her Milk Paint… it will change the way you do your DIY furniture projects! You know what is most inspiring about her blog? Her “mission statement”, if you will. On the right side of this kitchen reveal post of hers, read, ‘Move Mountains in your Home’… Truly has the heart of every budget decorator! 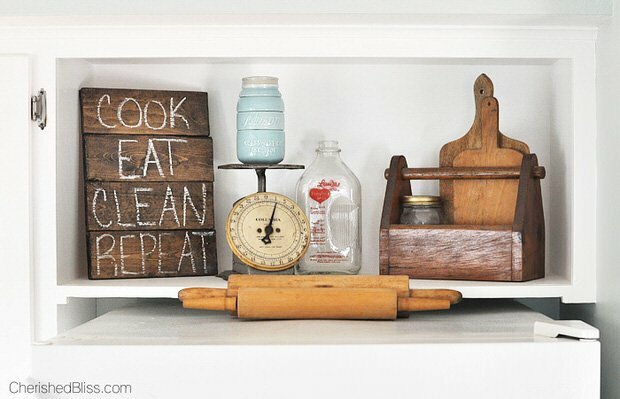 One last note… I included a second photo of hers, below… she not only used chalk paint on her end wall, but on the backs of the shelving in the cabinets too! 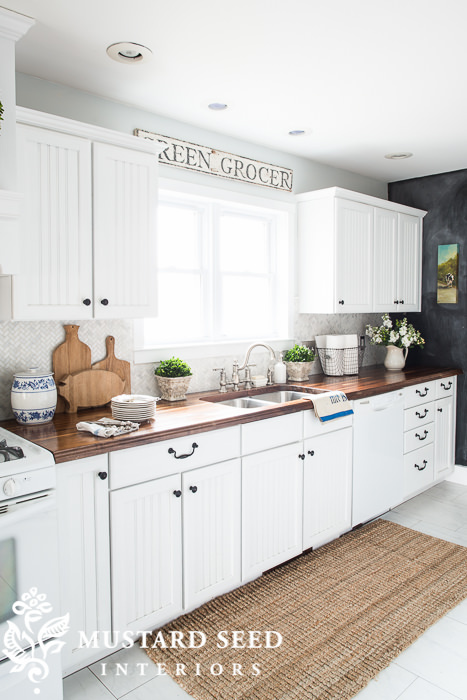 Kris from ‘Junk Chic Cottage‘ did a kitchen reveal makeover, and it’s the perfect inspiration for those of you who prefer a more cottage style. 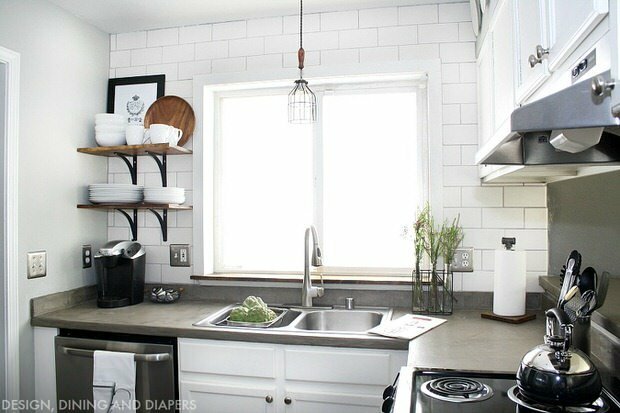 The first thing I have to say is that you must go see the before and afters of this kitchen… not because the difference is so dramatic, but because her kitchen was adorable before! 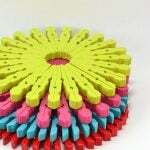 Visit ‘Junk Chic‘, and see her whole home! 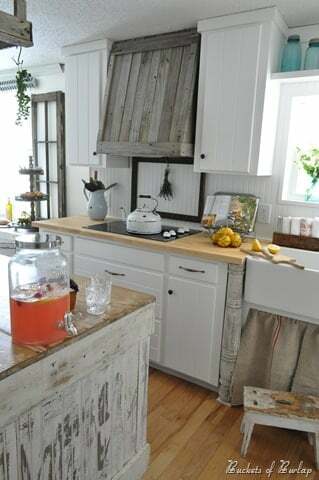 Becky at ‘Buckets of Burlap‘ did a farmhouse kitchen reveal that belongs in a magazine… Every detail is amazing, but I think her digressed paint finishes make this kitchen stand out. So farmhouse pretty! Ashley at ‘Cherished Bliss’ has a simple look that says volumes…It is fresh and light, but still so warm! 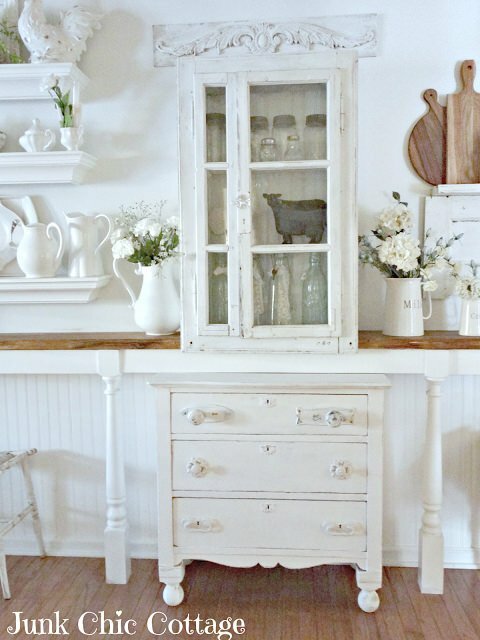 Be sure to go through to see her complete farmhouse cottage kitchen reveal. 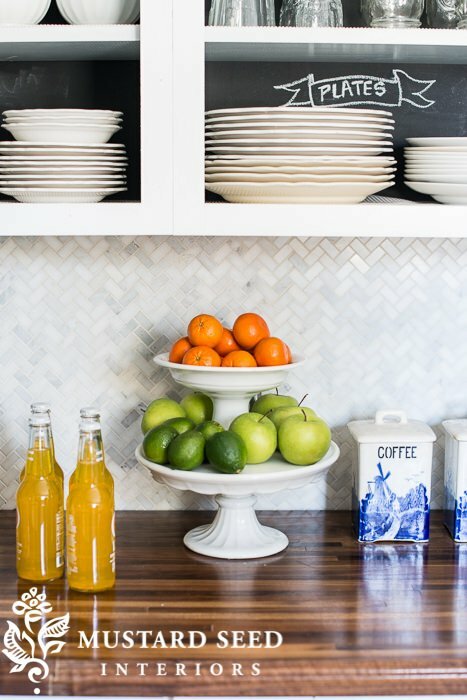 Brandi from ‘Nest of Bliss‘ has this amazing kitchen… Highlights? 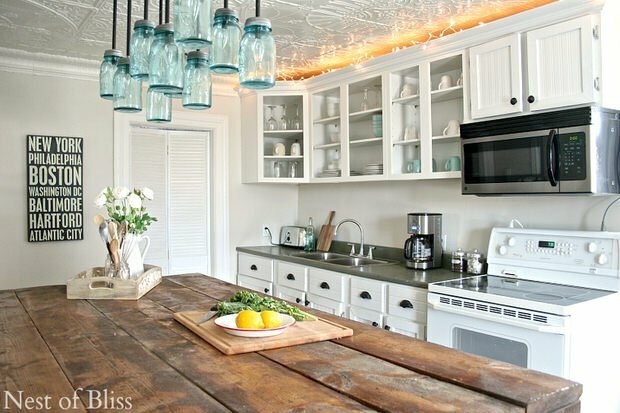 LOVE that insanely cool island… the whole kitchen is styled so well, love the fairy light above the cabinets, and you have to check out her “before” photo at her site… what an amazing transformation! Best thing about this post? 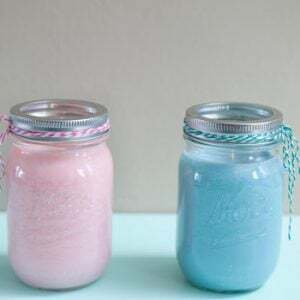 It has a link to a tutorial for that beautiful mason jar chandelier! (Just scroll all the way down to the bottom of the photos for the tutorials…) Gorgeous Brandi! 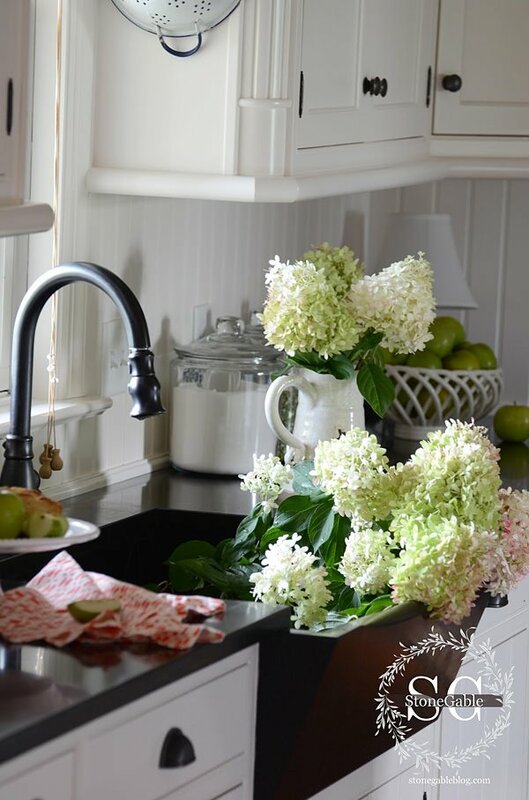 Lastly, check out ‘Stone Gable’s farmhouse kitchen reveal! It’s all about the details! 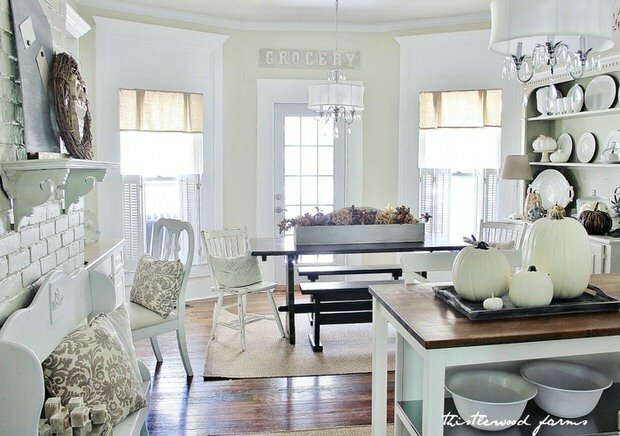 (Yes, I stole that from her site, :)) Go see the amazing job Yvonne did on her kitchen makeover. Are y’all about ready to move to the country? Thanks so much for the feature! I truly appreciate it, so much amazing inspiration on the post! KariAnne, your kitchen is so pretty, we appreciate you letting us share it! I feel so inspired for the New Year by all these great kitchens! Thanks so much for featuring StoneGable in your beautiful post! Thank you Yvonne, for such a gorgeous kitchen to share with our readers! Happy Holidays! Such a gorgeous kitchen Ashley! Thx for sharing with us! All I want for Christmas is your kitchen! Amazing kitchen Becky! 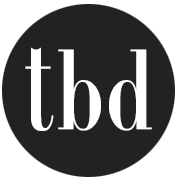 Thank you for letting us feature it for our readers! All of these kitchens are just Beautiful!! THE BEST pin I have found YET!! A million thank-you’s for directing me to these fabulous farmhouse kitchens. I can’t wait to take a closer look at all of them! We love our blogger kitchens too! 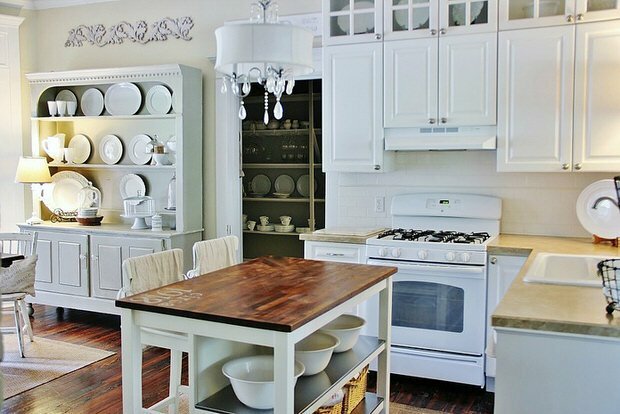 Maybe it’s just me but while these kitchens are quite lovely I want more color in my kitchen. I’m in Love with these! I am trying to create a similar vibe. My only color is butcher block counters and a light sea green accent on the island cabinets. But Pinterest inspired me so much. I love this grouping! Thanks!! Such an amazing kitchen. It looks very beautiful and modern, I just like it.